This is “Tech and Timing: Creating Killer Assets”, section 3.2 from the book Getting the Most Out of Information Systems: A Manager's Guide (v. 1.0). For details on it (including licensing), click here. Understand how many firms have confused brand and advertising, why branding is particularly important for online firms, and the factors behind Netflix’s exceptional brand strength. Understand the “long tail” concept, and how it relates to Netflix’s ability to offer the customer a huge (the industry’s largest) selection of movies. Know what collaborative filtering is, how Netflix uses collaborative filtering software to match movie titles with the customer’s taste, and in what ways this software helps Netflix garner sustainable competitive advantage. List and discuss the several technologies Netflix uses in its operations to reduce costs and deliver customer satisfaction and enhance brand value. Understand the role that scale economies play in Netflix’s strategies, and how these scale economies pose an entry barrier to potential competitors. Understand the role that market entry timing has played in the firm’s success. To understand Netflix strengths, it’s important to view the firm as its customers see it. And for the most part, what they see they like—a lot! Netflix customers are rabidly loyal and rave about the service. The firm repeatedly ranks at the top of customer satisfaction surveys. Ratings agency Forsee has named Netflix the number one e-commerce site in terms of customer satisfaction nine times in a row (placing it ahead of Apple and Amazon, among others). Netflix has also been cited as the best at satisfying customers by Nielsen and Fast Company, and was also named the Retail Innovator of the Year by the National Retail Federation. Building a great brand, especially one online, starts with offering exceptional value to the customer. Don’t confuse branding with advertising. During the dot-com era, firms thought brands could be built through Super Bowl ads and expensive television promotion. Advertising can build awareness, but brands are built through customer experience. This is a particularly important lesson for online firms. Have a bad experience at a burger joint and you might avoid that location but try another of the firm’s outlets a few blocks away. Have a bad experience online and you’re turned off by the firm’s one and only virtual storefront. If you click over to an online rival, the offending firm may have lost you forever. But if a firm can get you to stay through quality experience; switching costs and data-driven value might keep you there for a long, long time, even when new entrants try to court you away. If brand is built through customer experience, consider what this means for the Netflix subscriber. They expect the firm to offer a huge selection, to be able to find what they want, for it to arrive on time, for all of this to occur with no-brainer ease of use and convenience, and at a fair price. Technology drives all of these capabilities, so tech is at the very center of the firm’s brand building efforts. Let’s look at how the firm does it. Customers have flocked to Netflix in part because of the firm’s staggering selection. A traditional video store (and Blockbuster had some 7,800 of them) stocks roughly three thousand DVD titles on its shelves. For comparison, Netflix is able to offer its customers a selection of over one hundred thousand DVD titles, and rising! At traditional brick and mortar retailers, shelf space is the biggest constraint limiting a firm’s ability to offer customers what they want when they want it. Just which films, documentaries, concerts, cartoons, TV shows, and other fare make it inside the four walls of a Blockbuster store is dictated by what the average consumer is most likely to be interested in. To put it simply, Blockbuster stocks blockbusters. Finding the right product mix and store size can be tricky. Offer too many titles in a bigger storefront and there may not be enough paying customers to justify stocking less popular titles (remember, it’s not just the cost of the DVD—firms also pay for the real estate of a larger store, the workers, the energy to power the facility, etc.). You get the picture—there’s a breakeven point that is arrived at by considering the geographic constraint of the number of customers that can reach a location, factored in with store size, store inventory, the payback from that inventory, and the cost to own and operate the store. Anyone who has visited a video store only to find a title out of stock has run up against the limits of the physical store model. But many online businesses are able to run around these limits of geography and shelf space. Internet firms that ship products can get away with having just a few highly automated warehouses, each stocking just about all the products in a particular category. And for firms that distribute products digitally (think songs on iTunes), the efficiencies are even greater because there’s no warehouse or physical product at all (more on that later). Offer a nearly limitless selection and something interesting happens: there’s actually more money to be made selling the obscure stuff than the hits. Music service Rhapsody makes more from songs outside of the top ten thousand than it does from songs ranked above ten thousand. At Amazon.com, roughly 60 percent of books sold are titles that aren’t available in even the biggest Borders or Barnes & Noble Superstores.C. Anderson, “The Long Tail,” Wired 12, no. 10 (October 2004), http://www.wired.com/wired/archive/12.10/tail.html. And at Netflix, roughly 75 percent of DVD titles shipped are from back-catalog titles, not new releases (at Blockbuster outlets the equation is nearly flipped, with some 70 percent of business coming from new releases).B. McCarthy, “Netflix, Inc.” (remarks, J. P. Morgan Global Technology, Media, and Telecom Conference, Boston, May 18, 2009). Consider that Netflix sends out forty-five thousand different titles each day. That’s fifteen times the selection available at your average video store! Each quarter, roughly 95 percent of titles are viewed—that means that every few weeks Netflix is able to find a customer for nearly every DVD title that has ever been commercially released. This phenomenon whereby firms can make money by selling a near-limitless selection of less-popular products is known as the long tailIn this context, refers to an extremely large selection of content or products. The long tail is a phenomenon whereby firms can make money by offering a near-limitless selection.. The term was coined by Chris Anderson, an editor at Wired magazine, who also wrote a best-selling business book by the same name. The “tail” (see Figure 3.2 "The Long Tail") refers to the demand for less popular items that aren’t offered by traditional brick and mortar shops. While most stores make money from the area under the curve from the vertical axis to the dotted line, long tail firms can also sell the less popular stuff. Each item under the right part of the curve may experience less demand than the most popular products, but someone somewhere likely wants it. And as demonstrated from the examples above, the total demand for the obscure stuff is often much larger than what can be profitably sold through traditional stores alone. While some debate the size of the tail (e.g., whether obscure titles collectively are more profitable for most firms), two facts are critical to keep above this debate: (1) selection attracts customers and (2) the Internet allows large-selection inventory efficiencies that offline firms can’t match. The long tail works because the cost of production and distribution drop to a point where it becomes economically viable to offer a huge selection. For Netflix, the cost to stock and ship an obscure foreign film is the same as sending out the latest Will Smith chartbuster. The long tail gives the firm a selection advantage (or one based on scale) that traditional stores simply cannot match. For more evidence that there is demand for the obscure stuff, consider Bollywood cinema—a term referring to films produced in India. When ranked by the number of movies produced each year, Bollywood is actually bigger than Hollywood, but in terms of U.S. demand, even the top-grossing Hindi film might open in only one or two American theaters, and few video stores carry many Bollywood DVDs. Again, we see the limits that geography and shelf space impose on traditional stores. As Anderson puts it, when it comes to traditional methods of distribution, “an audience too thinly spread is the same as no audience at all.”C. Anderson, “The Long Tail,” Wired 12, no. 10 (October 2004), http://www.wired.com/wired/archive/12.10/tail.html. While there are roughly 1.7 million South Asians living in the United States, Bollywood fans are geographically disbursed, making it difficult to offer content at a physical storefront. Fans of foreign films would often find the biggest selection at an ethnic grocery store, but even then, that wouldn’t be much. Enter Netflix. The firm has found the U.S. fans of South Asian cinema, sending out roughly one hundred thousand Bollywood DVDs a month. As geographic constraints go away, untapped markets open up! The power of Netflix can revive even well-regarded work by some of Hollywood’s biggest names. In between The Godfather and The Godfather Part II, director Francis Ford Coppola made The Conversation, a film starring Gene Hackman that, in 1975, was nominated for a Best Picture Academy Award. Coppola has called “The Conversation” the finest film he has ever made,D. Leonhardt, “What Netflix Could Teach Hollywood,” New York Times, June 7, 2006. but it was headed for obscurity as the ever-growing pipeline of new releases pushed the film off of video store shelves. Netflix was happy to pick up The Conversation and put it in the long tail. Since then, the number of customers viewing the film has tripled, and on Netflix, this once underappreciated gem became the thirteenth most watched film from its time period. 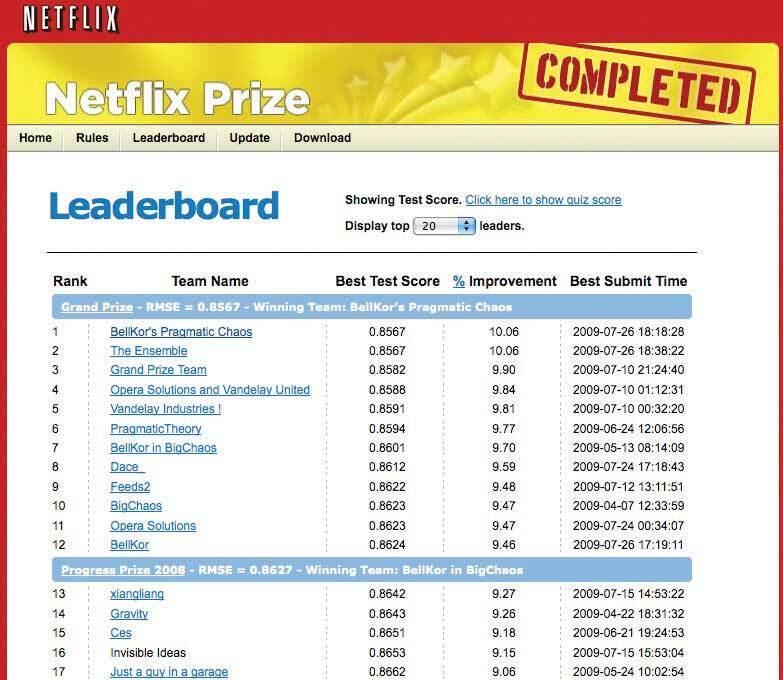 For evidence on Netflix’s power to make lucrative markets from nonblockbusters, visit the firm’s “Top 100 page.”http://www.netflix.com/Top100. You’ll see a list loaded with films that were notable for their lack of box office success. As of this writing the number one rank had been held for nearly four years in a row, not by a first-run mega-hit, but by the independent film Crash (an Oscar winner, but box office weakling).R. Elder, “‘Crash’ Remains Top DVD Rental,” Chicago Tribune, April 14, 2009. Netflix has used the long tail to its advantage, crafting a business model that creates close ties with film studios. Studios love Netflix because in most cases they earn a percentage of the subscription revenue for every disk sent out to a Netflix customer. In exchange, Netflix gets to buy the studio’s DVDs at cost. The movie business is characterized by large fixed costs up front. Studio marketing budgets are concentrated on films when they first appear in theaters, and when they’re first offered on DVD. After that, studios are done promoting a film, focusing instead on its most current titles. But Netflix is able to find an audience for a film without the studios spending a dime on additional marketing. Since so many of the titles viewed on Netflix are in the long tail, revenue sharing is all gravy for the studios—additional income they would otherwise be unlikely to get. It’s a win-win for both ends of the supply chain. These supplier partnerships grant Netflix a sort of soft bargaining power that’s distinctly opposite the strong-arm price bullying that giants like Wal-Mart are often accused of. The VCR, the Real “Killer App”? Netflix’s coziness with movie studios is particularly noteworthy, given that the film industry has often viewed new technologies with a suspicion bordering on paranoia. In one of the most notorious incidents, Jack Valenti, the former head of the Motion Picture Association of American (MPAA) once lobbied the U.S. Congress to limit the sale of home video recorders, claiming “the VCR is to the American film producer and the American public as the Boston strangler is to the woman home alone.”J. Bates, “Formidable Force for Hollywood,” Los Angeles Times, April 27, 2007. Not only was the statement over the top, Jack couldn’t have been more wrong. Revenue from the sale of VCR tapes would eventually surpass the take from theater box offices, and today, home video brings in about two times box office earnings. Netflix proves there’s both demand and money to be made from the vast back catalog of film and TV show content. But for the model to work best, the firm needed to address the biggest inefficiency in the movie industry—“audience finding,” that is, matching content with customers. To do this, Netflix leverages some of the industry’s most sophisticated technology, a proprietary recommendation system that the firm calls Cinematch. Each time a customer visits Netflix after sending back a DVD, the service essentially asks “so, how did you like the movie?” With a single click, each film can be rated on a scale of one to five stars. If you’re new to Netflix, the service can prompt you with a list of movies (or you can search out and rate titles on your own). Love Rushmore but hate The Life Aquatic? Netflix wants to know. The magic of Cinematch happens not by offering a gross average user rating—user tastes are too varied and that data’s too coarse to be of significant value. Instead, Cinematch develops a map of user ratings and steers you toward titles preferred by people with tastes that are most like yours. Techies and marketers call this trick collaborative filteringA classification of software that monitors trends among customers and uses this data to personalize an individual customer’s experience.. The term refers to a classification of software that monitors trends among customers and uses this data to personalize an individual customer’s experience. 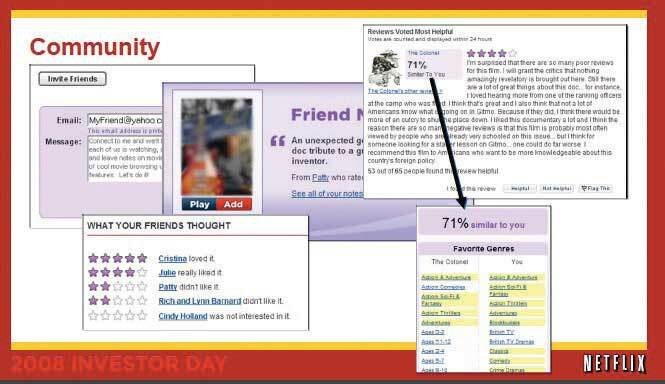 Input from collaborative filtering software can be used to customize the display of a Web page for each user so that an individual is greeted only with those items the software predicts they’ll most likely be interested in. The kind of data mining done by collaborative filtering isn’t just used by Netflix; other sites use similar systems to recommend music, books, even news stories. While other firms also employ collaborative filtering, Netflix has been at this game for years, and is constantly tweaking its efforts. The results are considered the industry gold standard. Source: Netflix Investor Day presentation, May 2008. Reproduced by permission of Netflix, Inc. Copyright © 2009, Netflix, Inc. All rights reserved. Collaborative filtering software is powerful stuff, but is it a source of competitive advantage? Ultimately it’s just math. Difficult math, to be sure, but nothing prevents other firms from working hard in the lab, running and refining tests, and coming up with software that’s as good, or perhaps one day even better than Netflix’s offering. But what the software has created for the early-moving Netflix is an enormous data advantage that is valuable, results yielding, and impossible for rivals to match. Even if Netflix gave Cinematch to its competitors, they’d be without the over-two-billion ratings that the firm has amassed (according to the firm, users add about a million new ratings to the system each day). More ratings make the system seem smarter, and with more info to go on, Cinematch can make more accurate recommendations than rivals. Evidence suggests that users trust and value Cinematch. Recommended titles make up over 60 percent of the content users place in their queues—an astonishing penetration rate. Compare that to how often you’ve received a great recommendation from the sullen teen behind the video store counter. While data and algorithms improve the service and further strengthen the firm’s brand, this data is also a switching cost. Drop Netflix for Blockbuster and the average user abandons the two hundred or more films they’ve rated. Even if one is willing to invest the time in recreating their ratings on Blockbuster’s site, the rival will still make less accurate recommendations because there are fewer users and less data to narrow in on similarities across customers. One way to see how strong these switching costs are is to examine the Netflix churn rateThe rate at which customers leave a product or service.. Churn is a marketing term referring to the rate at which customers leave a product or service. A low churn is usually key to profitability because it costs more to acquire a customer than to keep one. And the longer a customer stays with the firm, the more profitable they become and the less likely they are to leave. If customers weren’t completely satisfied with the Netflix experience, many would be willing to churn out and experiment with rivals offering cheaper service. However, the year after Blockbuster and Wal-Mart launched with copycat efforts, the rate at which customers left Netflix actually fell below 4 percent, an all-time low. And the firm’s churn rates have continued to fall over time. By the middle of 2008, rates for customers in Netflix most active regions of the country were below 3 percent, meaning fewer than three in one hundred Netflix customers canceled their subscriptions each year.Netflix Investor Day presentation, May 2008, accessed via http://ir.netflix.com/events.cfm. To get an idea of how enviable the Netflix churn rates are, consider that in 2007 the mobile phone industry had a churn rate of 38.6 percent, while roughly one in four U.S. banking customers defected that year.“Industry Customer Churn Rate Increases 15%,” GeoConnexion, January 8, 2008. The article contains a summary of the Pittney Bowes G1 finding. All of this impacts marketing costs, too. Happy customers refer friends (free marketing from a source consumers trust more than a TV commercial). Ninety-four percent of Netflix subscribers say they have recommended the service to someone else, and 71 percent of new subscribers say an existing subscriber has encouraged them to sign up. It’s no wonder subscriber acquisition costs have been steadily falling, further contributing to the firm’s overall profitability. Netflix isn’t content to stand still with its recommendation engine. Recognizing that there may be useful expertise outside its Los Gatos, California headquarters, the firm launched a crowdsourcingThe act of taking a job traditionally performed by a designated agent (usually an employee) and outsourcing it to an undefined generally large group of people in the form of an open call. effort known as The Netflix Prize (for more on crowdsourcing, see Chapter 6 "Peer Production, Social Media, and Web 2.0"). Source: Reproduced by permission of Netflix, Inc. Copyright © 2009, Netflix, Inc. All rights reserved. The goal was simple: Offer one million dollars to the first group or individual who can improve Cinematch’s ratings accuracy by 10 percent. In order to give developers something to work with, the firm turned over a large ratings database (with customer-identifying information masked, of course). The effort has attracted over 30,000 teams from 170 countries. Not bad when you consider that one million dollars would otherwise fund just four senior Silicon Valley engineers for about a year. And the effort earned Netflix a huge amount of PR, as newspapers, magazines, and bloggers chatted up the effort. While Netflix gains access to any of the code submitted as part of the prize, it isn’t exclusive access. The Prize underscores the value of the data asset. Even if others incorporate the same technology as Netflix, the firm still has user data (and attendant customer switching costs) that prevent rivals with equal technology from posing any real threat. Results incorporating many innovations offered by contest participants were incorporated into Cinematch, even before the prize was won. As the contest dragged on, many participants wondered if the 10 percent threshold could ever be reached. While many teams grew within striking distance, a handful of particularly vexing titles thwarted all algorithms. Perhaps the most notorious title was Napoleon Dynamite. The film is so quirky, and Netflix customers so polarized, that there’s little prior indicator to suggest if you’re in the love it or hate it camp. One contestant claimed that single film was responsible for 15 percent of the gap between his team’s effort and the million dollars.C. Thompson, “If You Liked This, You’re Sure to Love That,” New York Times, November 21, 2008. The eventual winner turned out to be a coalition of four teams from four countries—prior rivals who sought to pool their noggins and grab fame and glory (even if their individual prize split was less). BellKor’s Pragmatic Chaos, the first team to cross the 10 percent threshold, included a pair of coders from Montreal; two U.S. researchers from AT&T Labs; a scientist from Yahoo! Research, Israel; and a couple of Austrian consultants.B. Patterson, “Netflix Prize Competitors Join Forces, Cross Magic 10-Percent Mark,” Yahoo! Tech, June 29, 2009. It’s safe to say that without the Netflix Prize, these folks would likely never have met, let alone collaborated. Many critically acclaimed films that failed to be box office hits have gained a second life on Netflix, netting significant revenue for the studios, with no additional studio marketing. Babel, The Queen, and The Last King of Scotland are among the films that failed to crack the top twenty in the box office, but ranked among the most requested titles on Netflix during the year after their release. Netflix actually delivered more revenue to Fox from The Last King of Scotland than it did from the final X-Men film.Netflix Investor Day presentation, May 2008, accessed via http://ir.netflix.com/events.cfm. In the true spirit of the long tail, Netflix has begun acquiring small market titles for exclusive distribution. One of its first efforts involved the Oscar-nominated PBS documentary, Daughters from Danang. PBS hadn’t planned to distribute the disc after the Academy Awards; it was simply too costly to justify producing a run of DVDs that almost no retailer would carry. But in a deal with PBS, Netflix assumed all production costs in exchange for exclusive distribution rights. For months after, the film repeatedly ranked in the Top 15 most requested titles in the documentary category. Cost to PBS—nothing.C. Anderson, “The Long Tail,” Wired 12, no. 10 (October 2004), http://www.wired.com/wired/archive/12.10/tail.html. Tech also lies at the heart of the warehouse operations that deliver customer satisfaction and enhance brand value. As mentioned earlier, brand is built through customer experience, and a critical component of customer experience is for subscribers to get their DVDs as quickly as possible. In order to do this, Netflix has blanketed the country with a network of fifty-eight ultrahigh-tech distribution centers that collectively handle in excess of 1.8 million DVDs a day. 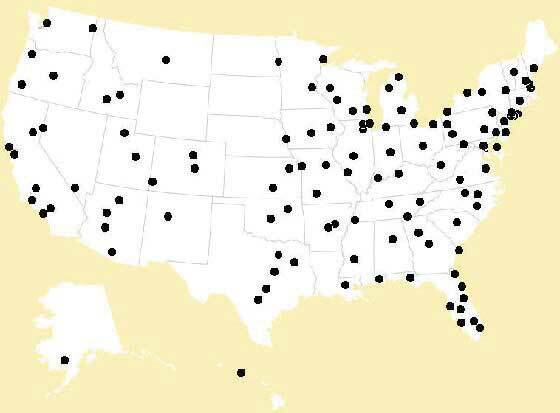 These distribution centers are purposely located within driving distance of 119 U.S. Postal Service (U.S.P.S.) processing and distribution facilities. By 4:00 a.m. each weekday, Netflix trucks collect the day’s DVD shipments from these U.S.P.S. hubs and returns the DVDs to the nearest Netflix center. 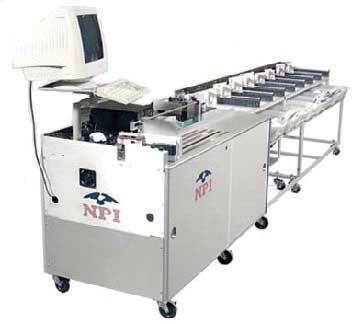 DVDs are fed into custom-built sorters that handle disc volume on the way in and the way out. That same machine fires off an e-mail as soon as it detects your DVD was safely returned (now rate it for Cinematch). Most DVDs never hit the restocking shelves. Scanners pick out incoming titles that are destined for other users and place these titles into a sorted outbound pile with a new, appropriately addressed red envelope. Netflix not only helps out the postal service by picking up and dropping off the DVDs at its hubs, it presorts all outgoing mail for faster delivery. This extra effort has a payoff—Netflix gets the lowest possible postal rates for first-class mail delivery. And despite the high level of automation, 100 percent of all discs are inspected by hand so that cracked ones can be replaced, and dirty ones given a wipe down.B. McCarthy, “Netflix, Inc.” (remarks, J. P. Morgan Global Technology, Media, and Telecom Conference, Boston, May 18, 2009). Total in and out turnaround time for a typical Netflix DVD is just eight hours!N. Kenny, “Special Report: Inside Netflix,” WMC TV, July 7, 2009. First-class mail takes only one day to be delivered within a fifty-mile radius, so the warehouse network allows Netflix to service over 97 percent of its customer base within a two-day window—one day is allotted for receipt; early the next morning the next item in their queue is processed; and the new title arrives at the customer’s address by that afternoon. And in 2009, the firm added Saturday processing. All this means a customer with the firm’s most popular “three disc at a time” plan could watch a movie a day and never be without a fresh title. Warehouse processes don’t exist in a vacuum; they are linked to Cinematch to offer the firm additional operational advantages. The software recommends movies that are likely to be in stock so users aren’t frustrated by a wait. Everyone on staff is expected to have an eye on improving the firm’s processes. Every warehouse worker gets a free DVD player and Netflix subscription so that they understand the service from the customer’s perspective and can provide suggestions for improvement. Quality management features are built into systems supporting nearly every process at the firm, allowing Netflix to monitor and record the circumstances surrounding any failures. When an error occurs, a tiger team of quality improvement personnel swoops in to figure out how to prevent any problems from recurring. Each phone call is a cost, not a revenue enhancement, and each error increases the chance that a dissatisfied customer will bolt for a rival. By paying attention to process improvements and designing technology to smooth operations, Netflix has slashed the number of customer representatives even as subscriptions ballooned. In the early days, when the firm had one hundred and fifteen thousand customers, Netflix had one hundred phone support reps. By the time the customer base had grown thirtyfold, errors had been reduced to so that only forty-three reps were needed.J. McGregor, “High Tech Achiever,” Fast Company, October 2005. Even more impressive, because of the firm’s effective use of technology to drive the firm’s operations, fulfillment costs as a percentage of revenue have actually dropped even though postal rates have increased and Netflix has cut prices. Netflix executives are quite frank that the technology and procedures that make up their model can be copied, but they also realize the challenges that any copycat rival faces. Says the firm’s VP of Operations Andy Rendich, “Anyone can replicate the Netflix operations if they wish. It’s not going to be easy. It’s going to take a lot of time and a lot of money.”Netflix Investor Day presentation, 2008, accessed via http://ir.netflix.com/events.cfm. While we referred to Netflix as David to the goliaths of Wal-Mart and Blockbuster, within the DVD-by-mail segment Netflix is now the biggest player by far, and this size gives the firm significant scale advantages. The yearly cost to run a Netflix-comparable nationwide delivery infrastructure is about three hundred million dollars.S. Reda and D. Schulz, “Concepts that Clicked,” Stores, May 2008. Think about how this relates to economies of scale. In the Chapter 2 "Strategy and Technology" we said that firms enjoy scale economies when they are able to leverage the cost of an investment across increasing units of production. Even if rivals have identical infrastructures, the more profitable firm will be the one with more customers (see Figure 3.7). And the firm with better scale economies is in a position to lower prices, as well as to spend more on customer acquisition, new features, or other efforts. Smaller rivals have an uphill fight, while established firms that try to challenge Netflix with a copycat effort are in a position where they’re straddling markets, unable to gain full efficiencies from their efforts. Running a nationwide sales network costs an estimated $300 million a year. But Netflix has over 3.5 times more subscribers than Blockbuster. Which firm has economies of scale? For Blockbuster, the arrival of Netflix plays out like a horror film where it is the victim. For several years now, the in-store rental business has been a money loser. Things got worse in 2005 when Netflix pressure forced Blockbuster to drop late fees, costing it about four hundred million dollars.T. Mullaney, “Netflix: The Mail-Order House That Clobbered Blockbuster,” BusinessWeek, May 25, 2006. The Blockbuster store network once had the advantage of scale, but eventually its many locations were seen as an inefficient and bloated liability. Between 2006 and 2007, the firm shuttered over 570 stores.A. Farrell, “Blockbuster’s CEO Ousted,” Forbes, July 2, 2007. By 2008, Blockbuster had been in the red for ten of the prior eleven years. During a three-year period that included the launch of its Total Access DVD-by-mail effort, Blockbuster lost over four billion dollars.MacDonald, 2008. The firm tried to outspend Netflix on advertising, even running Super Bowl ads for Total Access in 2007, but a money loser can’t outspend its more profitable rival for long, and it has since significantly cut back on promotion. Blockbuster also couldn’t sustain subscription rates below Netflix’s, so it has given up its price advantage. In early 2008, Blockbuster even briefly pursued a merger with another struggling giant, Circuit City, a strategy that has left industry experts scratching their heads. A Viacom executive said about the firm, “Blockbuster will certainly not survive and it will not be missed.”E. Epstein, “Hollywood’s New Zombie: The Last Days of Blockbuster,” Slate, January 9, 2006, http://www.slate.com/id/2133995. This assessment has to sting, given that Viacom was once Blockbuster’s parent (the firm was spun off in 2004). Durable brands are built through customer experience, and technology lies at the center of the Netflix top satisfaction ratings and hence the firm’s best-in-class brand strength. Physical retailers are limited by shelf space and geography. This limitation means that expansion requires building, stocking, and staffing operations in a new location. Internet retailers serve a larger geographic area with comparably smaller infrastructure and staff. This fact suggests that Internet businesses are more scalable. Firms providing digital products and services are potentially far more scalable, since physical inventory costs go away. The ability to serve large geographic areas through lower-cost inventory means Internet firms can provide access to the long tail of products, potentially earning profits from less popular titles that are unprofitable for physical retailers to offer. Netflix technology revitalizes latent studio assets. Revenue sharing allows Netflix to provide studios with a costless opportunity to earn money from back catalog titles: content that would otherwise not justify further marketing expense or retailer shelf space. The strategically aligned use of technology by this early mover has allowed Netflix to gain competitive advantage through the powerful resources of brand, data and switching costs, and scale. Collaborative filtering technology has been continually refined, but even if this technology is copied, the true exploitable resource created and leveraged through this technology is the data asset. Technology leveraged across the firm’s extensive distribution network offers an operational advantage that allows the firm to reach nearly all of its customers with one-day turnaround. What are Netflix’s sources of competitive advantage? Does Netflix have a strong brand? Offer evidence demonstrating why the firm’s brand is or isn’t strong. How is a strong brand built? What is the long tail? How “long” is the Netflix tail compared to traditional video stores? What “class” of software does Netflix use to make movie recommendations? Think about Chapter 2 "Strategy and Technology": Which key competitive resource does this software “create”? What kinds of benefits does this provide to the firm? What benefits does it provide to Netflix’s suppliers? Could a new competitor match Netflix’s recommendation software? If it did, would this create a threat to Netflix? Why or why not? What is the Netflix churn rate and what are the reasons behind this rate? Netflix uses technology to coordinate the process of sorting and dropping off DVDs for the U.S. Postal service. This application of technology speeds delivery. What other advantage does it give the firm? How has Netflix improved its customer service operation? What results reflect this improvement?